Live auctions online can offer fantastic prices for consumers who are purchasing jewelry or other items. Live auctions online can provide economic convenience for you to purchase items from the comfort of your own home. Live auctions online are also a fun and wise way to purchase items once you know the ropes. Consider the following tips for purchasing items through live auctions online. Live auctions online are auctions that post an item for sale for a beginning bidding price. For example, a gold wedding band may have a beginning bidding price of ten dollars. Live auctions online provide information on the same page that the item is advertised about the item. Bidders can then bid for the item, and can often bid several more times as the price rises. Many live auctions online provide a way for bidders to set a maximum bidding price one time, so that they do not have to constantly watch the bidding process. The system will do the bidding for them. For example: If you want to pay a maximum of $50.00 for that gold wedding band, you can set your bidding maximum at that price point and go ahead and bid possibly $12.00. As the bidding rises, the computer can automatically place your bid as the highest bid until the bidding reaches your maximum amount. If bidding passes that amount, you will be notified, and you will have the chance to bid again. Ask questions and discover if the live auction online bidding site you are considering has this maximum bidding feature. Read through the information and the policies of the live auction site online that you are considering. Reputable live auctions online provide information for you to be able to email the seller or call them directly to ask questions or to request additional photos of the item being sold. Read through the fine print. Each page that is advertising an item for sale will give information about that item. Watch for statements like, “color of actual item may vary” or “size of actual item may vary.” This means that you will not be bidding on the item that is actually shown in the photo. Depending upon the item you are bidding on, you may want to see the actual item, especially if you are bidding on loose gemstones. Look for shipping and handling information, also. Shipping charges should be offered straightforwardly. Handling charges should either be advertised. If they are not, they may be hidden. Beware of sellers that advertise shipping and handling charges for ten dollars, when in reality, the shipping is only $5.00. If you purchase an item at a great low price, you may not be concerned about a small handling fee. But, some handling fees can be higher than expected. Ask questions about the shipping and handling fees before bidding. Live auctions online can often offer valuable information about the product you are considering. If you are buying loose gemstones, ask about carat weight and any flaws or manufacture information that you may need in order to get the best buy possible. Are Live Auctions Online Worth the Time? The bottom line is live auctions online worth your time and effort? Absolutely. Live auctions online provide a fantastic convenient service for consumers who are wanting to purchase unique jewelry, loose gemstones, or silver or gold jewelry for less than what they would pay in a department or jewelry store. Why Use Live Auctions Online? If you want to purchase jewelry for less, either for your personal use or for resell, live auctions online could be the answer for you. Loose gemstones are often offered through live auctions online at discount prices. There are a variety of reasons for bidding for items through live auctions online. • Upgrading a piece of Jewelry. Upgrade a piece of jewelry by purchasing a new loose gemstone and replacing an old stone within a piece of jewelry. This saves money and also helps you create a unique custom item just for you. • Replacing a missing or loose gemstone. Replace missing or loose gemstones by purchasing loose stones through live auctions online. This is often less expensive than buying them through a jewelry store or a department store and gives you the freedom of choice. • Creating a custom jewelry item. Purchase loose gemstones from live auctions online if you are creating a custom jewelry item for yourself or a loved one. Custom items are perfect for bridal jewelry, heirloom jewelry or jewelry given for graduation or special birthdays. Live auctions online are usually either reserve auction bidding or no reserve auction bidding. Reserve auction bidding is a live auction online where the seller has a specific price point they want to reach with an item. For example, the bidding may begin at $20.00, but the reserve is set at $100.00. The reserve price is sometimes advertised and sometimes not. If you bid through a reserve live auction online service that advertises that it has a reserve, the item will often not be sold unless the reserve price is met. No reserve live auctions online are positive, economic and convenient ways to purchase items through the bidding process. If an auction advertises that it has no reserve, the price is set by the highest bidder for that item, but the seller still sets the beginning bidding price. 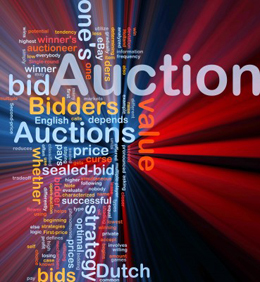 Bidding prices are often set very low in order to generate interest and excitement with the online bidders. No reserve live auctions online often offer wholesale or discount prices for items plus shipping and handling charges. If you are interested in bidding for items online, live auctions online offer ample opportunities to purchase quality items securely. Read the fine print and ask questions. Read through the policies and rules through the live auction of your choice and enjoy purchasing items at discount prices through a convenient and time-saving method.